Well, they say it's takes a big man to admit a mistake and apologize. 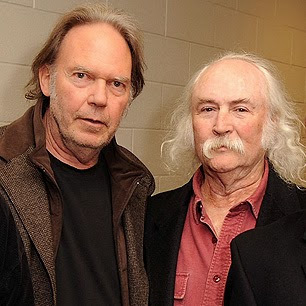 Earlier this week, David Crosby was on the Howard Stern Show and apologized for comments about Neil Young's girlfriend Daryl Hannah. "I was completely out of line," he said. "I have screwed up massively. Daryl Hannah never wound up in a Texas prison. I'm screwed up way worse than that girl. Where do I get off criticizing her? She's making Neil happy. I love Neil and I want him happy." Crosby said he believed the comments were off the record, but added, "That's neither here nor there." "Daryl, if you're out there, I apologize. Where do I get off criticizing you? There are people I can criticize: politicians, pond scum. Not other artists that have gone through a hard life, same as me. She hasn't had it easy either." Stern said he thought that Crosby made the comments out of love for his bandmate, and Crosby agreed. "I was worried that he was going to be taken advantage of," he said. "But the truth is that's not my place to judge. That's the bottom line. It's not my place to judge other human beings like that. That was judgmental and stupid and careless and I regret it a lot." Crosby said that he did call Young shortly after the comments surfaced. "He wanted me to print a retraction," he said. "I said, 'I don't know about that.' The first thing that I did was apologize right away. I said, 'Neil, I shouldn't have shot my mouth off. I'm sorry.'" He went on to say that he never spoke directly to Hannah. "But I'm doing that right now," Crosby said. "Daryl, I apologize. I was wrong. I have no place to stand to do that. I have no right. I haven't earned that right. I'm the guy that wound up in prison, not her." Meanwhile, it appears that is exactly what Ms. Pegi Young is doing -- carrying on.